In addition to the smooth magnetic resistance, the rower includes many other performance and comfort features. The aluminum channel rowing beam and ball-bearing rollers help the seat glide on both the push-off and return. Secondly, the pivoting footplates and foot straps ensure your feet are secure when rowing. 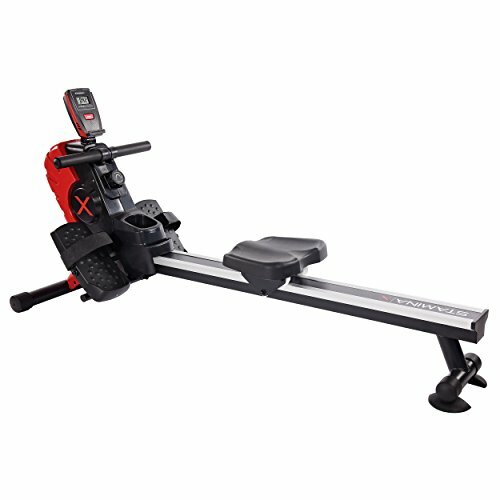 The Stamina Magnetic Rower 1101 has a sleek, redesigned housing unit and the comfort and performance features you need to succeed. With eight levels of quiet magnetic resistance, you're sure to get the total-body, cardiovascular workout you desire. Even more, it's perfect for the home. It's virtually silent; you'll be able to row without disturbing others. Plus, it transports and stores easily; just roll it to the nearest closet or corner and stand it on its end. Stores easily on end - Maximum user weight 250 lbs. The rower's multi-function workout monitor will motivate you to keep going and reach that next goal.